I've lived in San Francisco my entire life, and Muni is my way to get around the city when I don't want to use my car. Surely we all make jokes and tease the agency for its faults and problems, but have we ever considered the best moments and brightest ideas of Muni? NextBus/NextMuni: Probably one of the best investments Muni made into this technology that provides real time predictions of when a vehicle will arrive. Did you know the first buses to try the technology was the trolleybuses for the 22-Fillmore line? Now it's a normal fixture at many Muni vehicle stops, integrated into the 511 system, and even on smartphone applications. I'd say it's pretty accurate, give or take a few minutes. Automated announcements on buses: Prior to Muni having automated bus stop announcements in their vehicles, drivers were reminded regularly via radio to always make announcements for major stops. But now with the GPS linked equipment, the announcement system makes announcements for all stops with relative accuracy. While now the announcements are flooded with annoying announcements about not eating, drinking, and graffiti phone numbers, the announcement system makes it easier for passengers to know where they are. Free transfers: It's old school, but still works! Pay the fare and get a paper transfer to ride as many lines as you can before it expires. About 20 years ago, Muni decided to kill the transfers and so many people hated paying the cash fare every time they rode, the agency quickly returned the transfers to appease the passengers. Today, transfers are still going strong, with a 90 minute time limit on those using Clipper cards, and paper transfers sometimes having up to two hours. Air conditioning on Muni Metro: Prior to the grey Breda cars, Muni had the Boeing cars that only had windows providing ventilation for the trains. During the infamous meltdown, the Boeing cars were getting very warm while they were stuck in the tunnels. The new fleet of grey Breda cars didn't have windows that can open, but did have a very powerful air conditioning unit on each half of the train. Riding Muni metro on a very warm day in the city is one cheap way to stay cool. I've learned that standing next to the door is the best way to get direct ice cold air on your face. 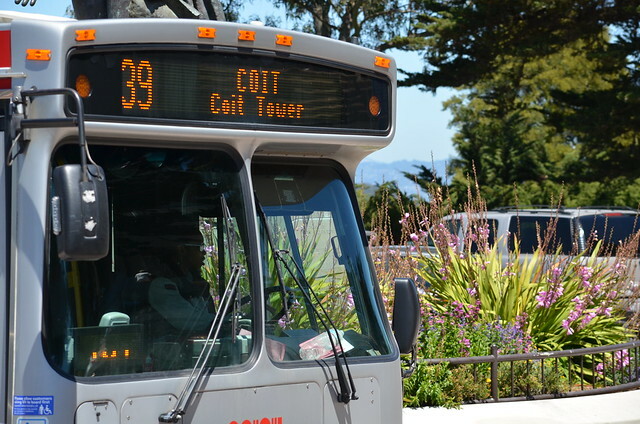 The Connected Bus: While it may be considered one of Muni's biggest flops, the technology had a great purpose for passengers. The hybrid bus was wrapped in green color and was regularly operated on the 18-46th Avenue line. The bus included free wireless internet and touch screens throughout the bus for passengers to interact with. One of the best parts was the screens kept in touch with the NextBus technology so it told passengers at upcoming transfer points, how long the wait will be when you got off at that stop. It worked like a charm when I had to transfer at one point on the route. Muni passes with BART access: The agreement Muni has with BART allows anyone with an "A" monthly pass ride BART for free within the city. BART service within San Francisco is faster than the surface buses and makes the ride to get around to certain districts in the city much easier. Without that agreement in the books, everyone would have to pay extra out of pocket money. Automatic Train Control: While the initial public usage of the ATC system on the metro caused a huge meltdown, once it was resolved, it helped Muni regulate the flow of train traffic and stop the risk of human error with train collisions. It also allows trains running in ATC mode to operate at the fastest speeds possible based on conditions, while trains that are overridden to operate manually must operate much slower to prevent accidents. The Farebox: Seems a little odd I'd be giving appreciation to Muni's current farebox. The old farebox used to be just coins only, but when the agency introduced the new farebox, it was a huge jump for the agency with a system that can accurately keep track of the money being fed, and was able to accept dollar bills. When the fareboxes was switched, the fare was just 85 cents, but when it rose to $1, the dollar bill feeder was a lifesaver for us folk who forgot to break that $1 bill. The F-Market Expansion: The F-Market was originally just for the agency's trolley festivals running from the Castro to the Transbay Terminal, but when it expanded to include Fisherman's Wharf, that's when things got much better. I remember back in the day, the only way to access the Wharf area was only taking the old 42-Downtown Loop route or walking from Chinatown/North Beach. When the F-Market ran along the Embarcadero, it helped bring more tourism to the Wharf area and provided a nice look to the area, instead of loud diesel buses going around the area. Cable Car Running Boards: The true way to ride a Cable Car in San Francisco is to ride on the running board. For some, it's the thrill of hanging on tight on that pole while traffic passes by on your side, and for others, it's just the normal way of life in the city. Every time I ride the Cable Car, I always want the running board and not a seat or standing in the inside. Luckily, the city hasn't banned this policy and I hope it continues forever. If you had to generate a list of the best things Muni has done, what would you say? Leave a comment. Muni was the first public transit system in the USA.